A panorama sunroof sometimes called panoramic sunroof or moonroof is a larger or multi panel sunroof that offer the benefits of a sunroof to the front and rear passengers of the vehicle. The roof can be one large glass panel or more commonly two glass panels to have separate sunroofs for the front and rear passengers. Although there may be two seperate glass panels, together they give fill entire passenger cabin with natural light during the day, the ability for every one to gaze at the moon and stars during the night. They also offer the option of fresh air while driving as they can be opened. Panorama sunroofs vary by the manufacturer and by the model of vehicle but the front glass panel usually has more mobility than the rear. The controls for the moonroof are usually located in close proximity to the interior rear view mirror. Some of the features of the panorama sunroof is that the front glass can slide back over or under the rear glass. The front glass may also be able to slide back and stay partially open. Both the front and rear sunroofs may be able to tilt or the rear glass may be fixed and only the front glass may have the tilt feature. 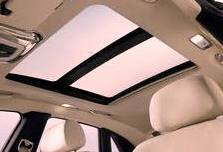 Whenever the panorama sunroof is not wanted a sunshade or sunshades is used to block out the light and offer that closed secluded feeling that sometimes associates itself with comfort and luxury. There can be one sunshade to cover the entire moonroof or each glass can have its own sunshade. The singular sunshade is usually operated by a motor and when there are two, the rear can be operated by a motor or manually. Panoramic sunroofs are commonly found on sedans, station wagons and sport utility vehicles as the long roofline will accommodate this feature. An aftermarket panoramic sunroof can be installed on a vehicle by various agencies but when it is ordered from the manufacturer before purchase (which is the only time to order a panorama sunroof in most cases) issues such as changes in center of gravity and curb weight if any will be taken into greater consideration.